6. Kid's playground, tennis and basketball courts! 7. Free Seasonal shuttle to beach, Destin Commons, & Harborwalk Village. You'll never want to leave the Palms of Destin! Stay here for a true 'resort' experience. Palms Resort #2611 is a Junior 2BR/2BA, which is a 2 bedroom with a full sized master plus a smaller bedroom and 2 full sized bathrooms, one with a walk in shower. The master has a king sized bed. The second room has a bunk bed with twin over full, a television and its own bathroom entry. There's a pull out sofa bed in the living room. This unit also has a washer & dryer. Located on 15 beautiful acres, The Palms of Destin Resort and Conference Center offers an unbeatable, upscale experience in the heart of Destin at an affordable price. As an exclusive guest you will enjoy Destin’s largest lagoon pool beneath swaying palms or simply enjoy our many amenities including kid's activities, fitness center, kids playground, tennis and basketball courts. You'll also be within walking distance of Joe's Crab Shack, Bubba Gump Shrimp Factory, The Back Porch (a Destin classic), Ruth's Chris Steak House, Jim-N-Nick's BBQ and Hooters. The views! The location! The beach! This was an awesome condo. Very spacious and comfortable. Beautiful Condo! wonderful resort and staff. We will come back again! Hi Susan, thank you for your feedback on your stay at this lovely condo. We’re happy to hear you had a wonderful stay and found the unit beautiful. We value your referrals and hope you will come back to visit! Thank you again for your feedback and thank you for staying with Real Joy! Nice and quiet. Perfect spot. Close to everything. Hi Derrick, thank you for your feedback on your stay at this lovely condo. We’re pleased to hear you had an excellent stay and found it nice and quiet. We value your referrals and hope you will come back to see us. Thank you again for your feedback and thank you for staying with Real Joy! I was prepared to have an interactive and coordinated experience. This stay came as a recommendation from another guest, who was quite impressed with the pro activity of the staff in coordinating and scheduling their day passes and transportation to local venues. In every conversation I had with the customer service members, I was left disappointed. There was no transportation, we had to pay out of pocket for an Uber anywhere we wanted to go. There was no accommodation for the lack of options for explorie options. We were given the choice of golf or nothing. Which is quite the difficult task for someone recovering from a back surgery who has never touched a club. There was no suggestion of alternatives or even a remote desire to create a positive customer experience. We incurred additional cost for activities we found with no help of real joy. I had such high hopes for this trip, but was left disappointed and to be honest, cast aside as a guest who was traveling out of peak season. I would have had a better time, gotten more value for my dollar and a more customer centric experience had I just booked with a hotel chain. I would never again stay with a real joy property or suggest anyone I know waste their time and money with this company. This trip was a complete let down. Hi Kailee, thank you for taking the time to leave us a review of your stay. 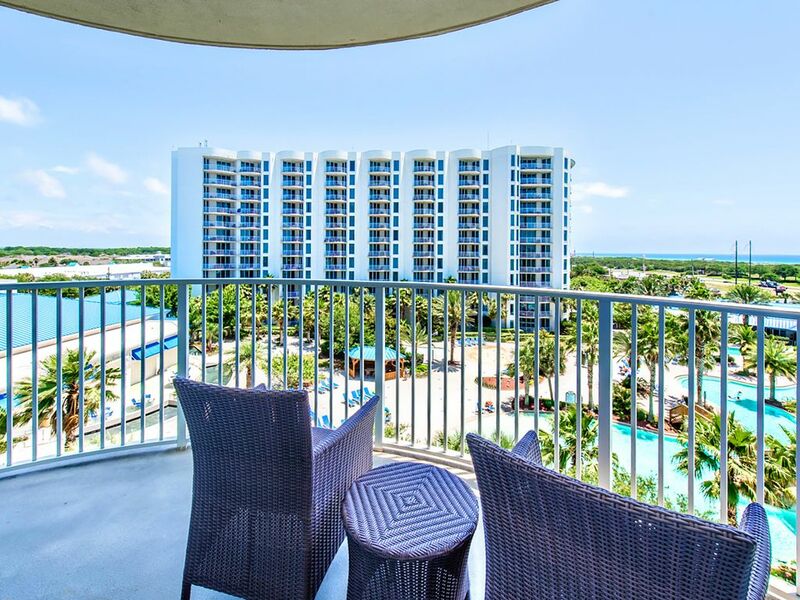 We hope you enjoyed the pool and gulf views from this amazing unit. We assume that you found the 2 bedroom condo you rented to be clean, comfortable and meet your needs since you left no negative comments about it. It sounds like you were under the impression that you were going to have transportation during your trip. We wish you had contacted us to clarify that if it was something that was important to you. To help you understand, we are the property managers of individual condos at the Palms under our care. We have no control over amenities that the building provides. The building at the Palms of Destin does run a shuttle but it is seasonal and we have tried to be very clear with that information in all of our ads. Also, the Real Joy funpass is super limited at this time of year. We also have all of that information on our ads that spell out the time frames that each activity is available and let you know that golf is pretty much the only activity available during the winter in Northwest Florida. We are sorry you were disappointed but think that a phone call could have prevented these misunderstandings. Thank you for your feedback. Beautiful property, great views and close to lots! Hi Kristi, thank you for your feedback on your stay at this lovely condo. We’re happy to hear you had a great week and found the unit beautiful and views great! We value your referrals and hope you will come back to visit! Thanks again for your feedback and thank you for staying with Real Joy! Hi Sarah, thank you for your feedback on your stay at this lovely condo. We’re pleased to hear you loved the pool and we hope you enjoyed the great views as well. Thanks again for your feedback and thank you for staying with Real Joy!